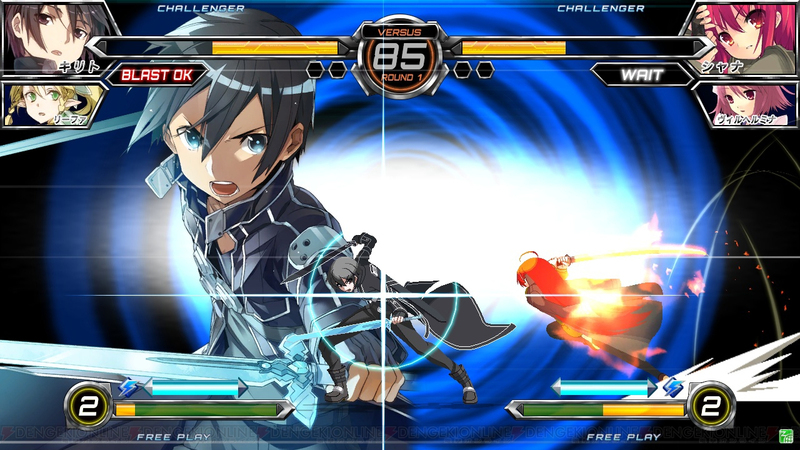 Dengeki Bunko: Fighting Climax is a 2D Japanese fighting game. If you have any experience with these kinds of games, you likely already know if you’re on board or not, and for those of you that are on the fence, allow me to help you decide if this game has what you’re looking for. The main draw for SEGA’s arcade fighter is the inclusion of popular anime and manga characters from the Dengeki Bunko publishing firm located in Japan. Popular characters like Shizuo from Durarara!! and Kirito from Sword Art Online are playable with move sets and animations that are deeply reminiscent of their source material. If you’re a fan of these characters going in, it is admittedly very enjoyable to see them in action! The game has twelve characters with two more that are unlocked by completing arcade mode. The character selections for the cast are a little odd, with main characters from some anime/manga only being assist characters, while a supporting character from the same series is a playable character. And of the games cast, more than half of the female characters are school girls in miniskirts, and while I’m not opposed to schoolgirls in miniskirts, when half of the game’s cast is made up of school girls in the same outfit, it makes the cast seem less exciting overall. In a way it makes them seems borderline generic if you don’t recognize the characters. Dengeki Bunko: Fighting Climax is a solid fighting game. As a fan of the genre, I can tell you it’s unique and fun, even if it’s a little shallow. The game uses four buttons: Light, Medium, Heavy and Assist, and has a command list of special moves, some being “quarter circle” motions reminiscent of classic 2D fighting games, and some being two buttons. The game boasts that it has very accessible controls, and while it’s not the hardest fighting game I’ve played, I wouldn’t recommend it to someone who is new to the genre. The combo system doesn’t encourage much creativity, and a lot of button sequences work across the whole cast, and combo length is limited by resources like your burst and super meter. Even the unique character traits, or “Trump Cards,” are similar to each other. Either being a reversal attack or an attack canceling power up, but each character’s trump card gives the same temporary buff. A lot of parts of this game feel much too uniform, in a way that takes away from the individuality of each character. But even with its flaws, there’s something fun about the crazy and over the top nature of the game that I just can’t deny. But even if the game is fun, I wouldn’t recommend it to someone who is new to the genre. If you don’t have experience doing combos in other 2D fighting games, Dengeki Bunko is far from the best game to learn. The game does allow you to do “Auto-Combos” by mashing on the light attack button, but that won’t be entertaining for more than five minutes. The biggest problem Dengeki Bunko has with accessibility is its lack of any kind of tutorial. The game doesn’t even have a trial mode to teach players combos. I consider myself an experienced fighting game player, but the game uses terms like “extend action” with zero indication of what that means or how to do it. If you’re not willing to look up how to play this game on a forum, you’ll have a lot of trouble getting anywhere. In terms of single player content, this game falls flat. The need for the inclusion of tutorials or challenge modes is something we shouldn’t even have to mention in 2015. Dengeki Bunko features a short arcade mode with a very weak story that loosely and lazily explains the premise of the characters crossing between worlds. There is also the “Dream Mode” where the player can choose a character and have them interact with one of six other characters, which will result in them fighting. While I’ll admit that Dream Mode did make me laugh, the interactions are very predictable and the overall experience is very short lived. 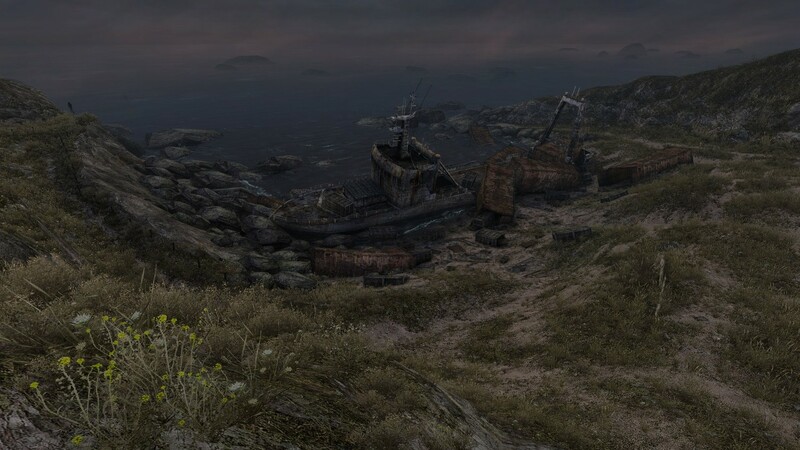 The game also features online multiplayer, but pre-release, the online was completely barren, and will likely be that way again soon after the games release in the United States. This game was released on consoles in Japan back in March of 2014. Almost anyone who was interested in playing this game imported it, and has likely already moved on. The only matches I did play were terribly laggy due to the opponent being located in Japan. The one match I did play with what the game considers a good connection was much better than I was expecting, but the framerate did occasionally stutter. The online overall will be playable if you play with people in your same country, and both of you have stable, wired connections. Overall, Dengeki Bunko feels like a fighting game port from the early 2000’s. It just doesn’t feel like a full package compared to other games in the genre that have come out in the last few years. The lack of a tutorial or any real kind of story mode make the game feel like a bad value overall, but I can’t deny the fun I’ve had playing the game with others. There’s a fun and unique game here, complete with a good soundtrack and fun characters. 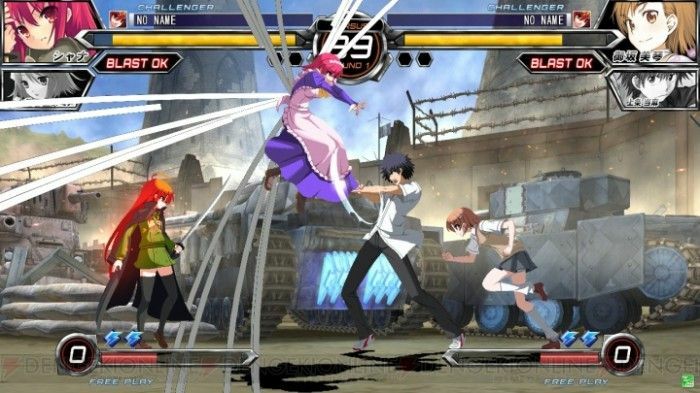 It’s not the best fighter I’ve ever played, but I can see Dengeki Bunko being a game that I bust out once it a while to play with some fighting game savvy friends, maybe over drinks!